Polaroid Fotobars: Retail stores will print out Instagrams, Facebook photos. Polaroid’s first Fotobar, in Delray Beach, Florida, will let users upload images from smartphone apps like Instagram and Picasa to editing workstations, then have them printed out on anything from metal to bamboo. It’s been a long fall for Polaroid, which slept on the digital-photography revolution, went bankrupt, was resurrected, and went bankrupt again. In recent years, it has tried to reinvent itself with a succession of generally awkward new products, like a “smart camera” that doubles as an Android phone. But this week the company announced a new idea so simple and natural that it just might work. Partnering with a startup called Fotobar, it plans to open a chain of retail stores where customers can come in and print out their favorite pictures from their mobile phones. The first is scheduled to open in February in Delray Beach, Florida, and the goal is to open 10 locations across the country before the year is out. The idea has obvious appeal in an era when most of our best pictures live only on the screen. Of course there are other options for printing out hard copies, including Walgreens. But Fotobar is aiming higher, with dedicated retail outlets that sport an Apple Store-like layout and well-trained employees to help customers through the editing process. Customers will upload their image wirelessly from their smartphone to a bar-top workstation, customize it to their liking, and then print it out on anything from canvas to metal to bamboo—or even old-school Polaroid stock, complete with the iconic border. The basic Polaroid-style printouts will start at about $15 and be ready at the store within five to 10 minutes, Fotobar founder and CEO Warren Struhl told me. Prints on more exotic materials, or with framing and matting, will ship from a manufacturing facility within three days. 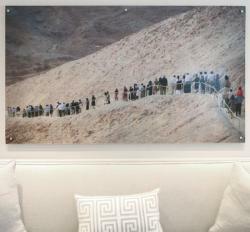 At the extreme high end, Struhl said he has already had one customer order a print of a vacation photo of his family descending a mountain in Israel on super-thick, five-by-seven-foot acrylic Lucite. “They’ll be hanging this in a multimillion-dollar home,” he said. One early Fotobar customer ordered a $2,000 print of a family vacation snapshot on five-foot by seven-foot acrylic, to hang above the living-room couch. The artisanal approach is a departure from the original Polaroid experience, which was all about instant gratification. But immediacy is no longer what’s missing in photography today. We can share any image with anyone in seconds with a couple clicks of a smartphone button. What our photographs lack today are the permanence of tangibility. Fotobar’s Struhl told me he thinks there’s a great hidden desire for that. “When I ask people to show me their favorite picture, they take out their phone,” he said. “My next question is, does that favorite picture you just showed me live in a physical form? Does it exist on your wall, your desk, or your shelf? I get two answers. One is ‘no.’ Literally everyone says no. And the second is, everyone says, ‘and it pisses me off.’ Because it’s too complex: ‘I don’t know what I’m going to get, I’ve got to plug something in, I don’t really know if this picture’s good enough.’ So I realized there was a pain point in people’s lives.” Struhl thinks the way to fix that is not just by making it easier, but by making it pleasant, educational, and fun—by turning the work into play. That’s the Fotobars’ goal. At first I was envisioning kiosks in malls, and Struhl said that’s one possibility, but the first store will be a more conventional 2,000-square-foot retail store in a shopping center. There are also plans for a few street-level storefronts and airport locations. “If we can get close to Apple Stores, we think that would be a great location,” Struhl said. That’s likely to impose some high overhead costs, which is probably why the printouts won’t be cheap. And it means there’s a good chance the project will ultimately go bust. But I hope that doesn’t happen before I get the chance to try one out. Having lost its way in a high-tech world, Polaroid is going back to “high touch.” If it succeeds, the company will have pulled off a feat that few foresaw: returning to relevance in the age of Instagram. 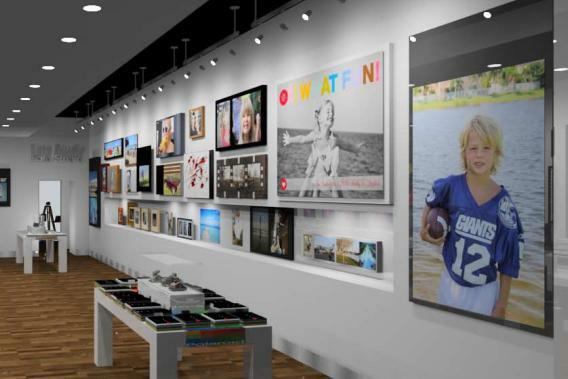 The walls of each fotobar will feature a gallery of examples of blown-up smartphone images.